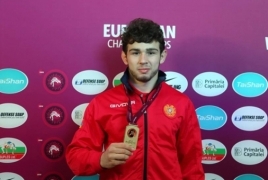 Armenian freestyle wrestler Arsen Harutyunyan (61 kg weight category) has won gold at the European Championships, currently underway in Bucharest, Romania. Harutyunyan defeated Beka Lomtadze of Georgia in the final round to win the coveted medal. The Armenian team thus has a new European champion after a 6-year break.